At long last we had a good day for the kite club fly. At first, the winds were swirly and light. Kites were falling out of the sky. But after about a half an hour, the winds picked up and flying became great. There were about ten of us on the beach. A couple of flyers brought out their Revolution quad line kites and flew them exclusively. One of our friends flew a couple of his dual line stunt kites, including the Trick & Track by Premier. The rest of us put up couple of single line deltas, a box delta with long tails, a small Eddy train by New Tech, an EO6 by Prism, a small blue flame dragon, one of the snowflake kites by New Tech that were featured in the Starbuck’s commercial and the Xelon trio by HQ kites. Yes, I finally got all three of my Xelons up together. I even remembered to bring my camera and made sure that I had enough room on the memory card to snap a few shots. And then, just as I’m composing the image of all three kites in the air, the camera shuts off. Well, I was puzzled at first. I turned the camera back on and then saw the dreaded icon in the viewfinder. The battery image was flashing at me. Yes, the batteries died. No warning. Just a quick view of the flashing icon and then nothing. I did manage to get a couple of images by shooting once and then turning the camera off for a while and then grabbing another image and turning the camera off again. Some days I can’t help but wonder why I even try. Things looked up, however, when I found out the owner of the local kite shop brought a couple of new quad line kites to try out. One was the Volks Quad from New Tech and the other was the Vamp Devil from flying wings. Now, I’m not a quad line flyer. But as soon as I saw the Vamp Devil, I knew I had to learn how to fly that kite. It just looked like so much fun. So when the field trials of the Volks Quad were done, I got my chance at the Vamp Devil. It was as much fun as it looked. And this from a rank beginner at quad line flying. Vamp Devil looks like a large cartoon bat with two white fangs and big round eyes that are actually mesh. 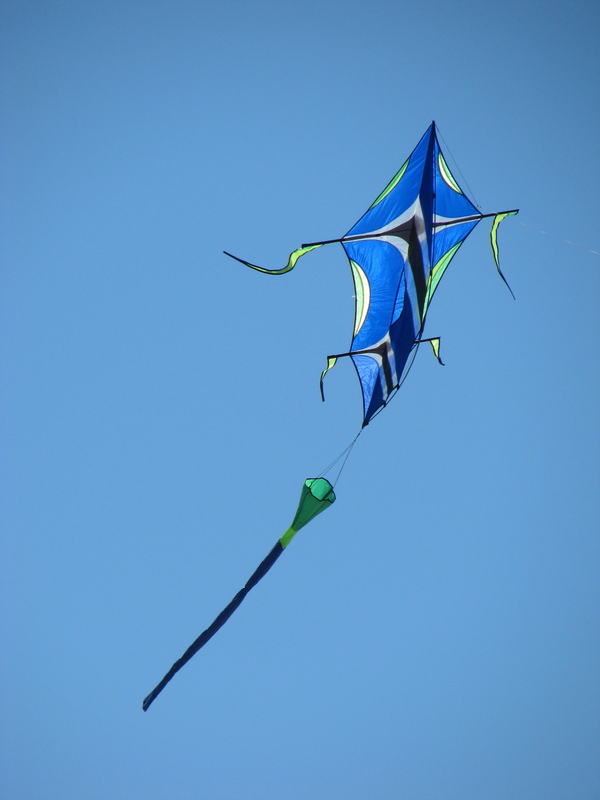 It has a removable forked tube tail that slows the flight down and looks great trailing behind the kite as it flies. 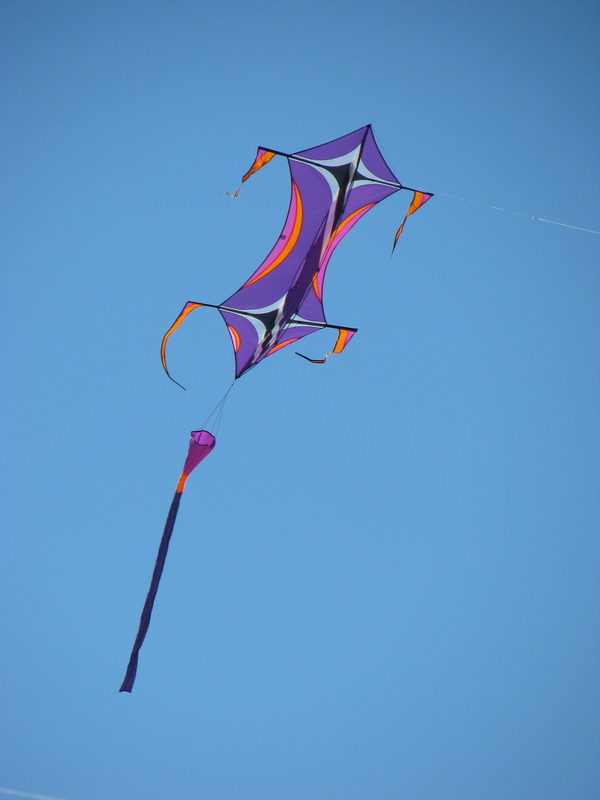 When the winds were light, we took the forked tail off the kite. It flew easily and was very forgiving of my jerky line movements. As the winds picked up, we put the tail back on. It didn’t take long for me to be doing loops and spins. And I was able to recover from a couple of mild crashes without resorting to the “walk of shame”. (Meaning having to stake the handles and walk to the kite to untangle it and set it upright for launching.) I have decided this is a must-have kite for my bag. Now I just have to decide on colors. Work is continuing on the Penelope Cat kite that I am making. The stitching for the applique is done. Now I have to start cutting away the fabric I don’t want and reveal the colors I do. This won’t take as long as the Pepe Le Pew kite. There are fewer details on the cat. Hopefully, I can finish it before I leave on Tuesday.